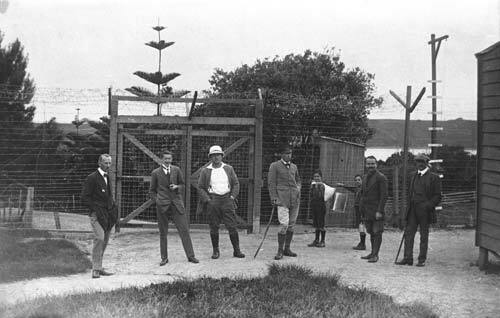 Motuihe, offshore from Auckland, was a quarantine station that became a camp for ‘enemy aliens’ during the First World War. Felix von Luckner (centre, with stick) was the most prominent prisoner of war. A German count known as ‘the Sea Devil’, he had commanded the sailing ship and commerce raider, Seeadler. Eventually captured in Fiji in September 1917, he was imprisoned on Motuihe. However, he escaped in December, using the ruse of a Christmas play to get provisions and capture the island’s launch. He was recaptured in the Kermadecs, and after spending time at Ripapa Island (Lyttelton Harbour), he was taken back to Motuihe.